Jacob was left all alone after he had sent his 2 female servants, 2 wives, and 11 sons across the Jabbok brook. 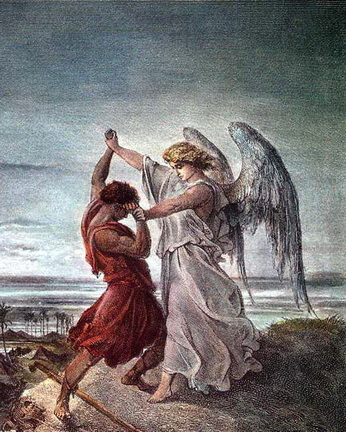 At night, an angel of God wrestled with Jacob until the sun rise in the morning. When the angel of God saw that he cannot overcome Jacob. He touches the hip of Jacob and the socket of Jacob’s hip was out of place. And so Jacob couldn’t walk properly and was limb. But Jacob was still holding on to the angel of God and will not let go. Jacob named the place Peniel because he sees God face to face and yet he survives. Just as the sun was rising over Peniel, Jacob arose and limped on his hip. That is why the people of Israel today do not eat the muscles from the socket on the hip which shrank because He touched Jacob’s socket and its muscle shrank.